In this article, we will present a number of technical results concerning Classical Logic, ST and related systems. 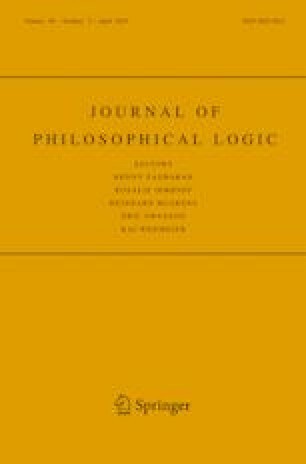 Our main contribution consists in offering a novel identity criterion for logics in general and, therefore, for Classical Logic. In particular, we will firstly generalize the ST phenomenon, thereby obtaining a recursively defined hierarchy of strict-tolerant systems. Secondly, we will prove that the logics in this hierarchy are progressively more classical, although not entirely classical. We will claim that a logic is to be identified with an infinite sequence of consequence relations holding between increasingly complex relata: formulae, inferences, metainferences, and so on. As a result, the present proposal allows not only to differentiate Classical Logic from ST, but also from other systems sharing with it their valid metainferences. Finally, we show how these results have interesting consequences for some topics in the philosophical logic literature, among them for the debate around Logical Pluralism. The reason being that the discussion concerning this topic is usually carried out employing a rivalry criterion for logics that will need to be modified in light of the present investigation, according to which two logics can be non-identical even if they share the same valid inferences. The material included in this article has been presented at the Formal Methods in Philosophy workshop held in Munich as a part of a DFG-MINCYT collaboration project, at the Kolloquium Logik und Erkenntnistheorie of the Ruhr-Universität Bochum, at the Liars, Curries and Beyond workshop held in UNAM, at the 2nd Workshop on Dialetheism and Paraconsistency held in the University of Kyoto, and at VII Workshop On Philosophical Logic held in Buenos Aires. Thanks to the audiences of these events for their comments and helpful feedback. In addition, we are thankful to thank Bogdan Dicher, Luis Estrada González, Thomas Ferguson, Melvin Fitting, Andreas Fjellstad, Rohan French, Hitoshi Omori, Francesco Paoli, Graham Priest, Greg Restall, Dave Ripley, and the members of the Buenos Aires Logic Group for discussing previous versions of this work. Finally, we would like to express our gratitude to the anonymous reviewers for this journal, whose suggestions helped to substantially improve the article. Barrio, E., Pailos, F., Szmuc, D. (Forthcoming). A recovery operator for non-transitive approaches. Review of Symbolic Logic. https://doi.org/10.1017/S1755020318000369. Barrio, E., Pailos, F., Szmuc, D. (Forthcoming). Substructural logics, pluralism and collapse. Synthese. https://doi.org/10.1007/s11229-018-01963-3. Dicher, B., & Paoli, F. (Forthcoming). The original sin of proof-theoretic semantics. Synthese. https://doi.org/10.1007/s11229-018-02048-x. Pailos, F. (Forthcoming). A family of metainferential logics. Journal of Applied Non-Classical Logics. https://doi.org/10.1080/11663081.2018.1534486. Pailos, F. (Forthcoming). A fully classical truth theory characterized by substructural means. The Review of Symbolic Logic. https://doi.org/10.1017/S1755020318000485.